During this lovely month of October, while sauntering up the Klamath River to visit my ancestral village of Coyote's Paw, I'll be stopping at Bogus Elementary School to share native stories. 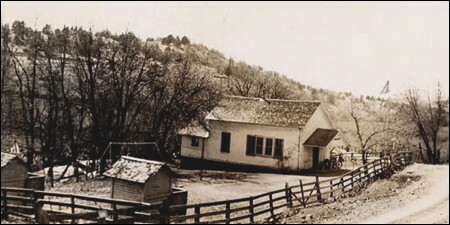 The school was first built in 1871, and then rebuilt a hundred years later. This is a K-8 school with 19 students, and the Teacher/Principal was a student there when she was a child. Yes, folks, there's still places like this tucked away in the backcountry. And I love visiting them! Bogus got its name because two men were making bogus money. A tall man and a short man each had a counterfeiting operation up separate creeks -- they were minting half dollars -- and those creeks got named Big Bogus Creek and Little Bogus Creek. Though I can't document this, I'm thinking the tall man was on Big Bogus Creek and the short man on Little Bogus Creek. But that's just a guess. An eastern spur of the Oregon-California Stage Road followed the Klamath River through here, from Ager to Linkville (Klamath Falls). Holdups were common. So were shootouts. Up the road on Topsy Grade, a masked robber jumped from Robber's Rock onto the top of a stagecoach, grabbing the reins as he pushed the driver onto the road. One holdup occurred in Gold Creek Canyon near Bogus. Before he was caught, the robber hid the gold nearby. Although he drew a map, the robber died in jail and his cellmate never found the treasure. Maybe it's still out there! Down Bogus Creek from the school is an old church still in use. The original congregation might have dubbed it Bogus Chapel, but opted for Copco Community Chapel instead. Copco (the letters stand for California Oregon Power Company) is the old name for Pacific Power. They built dams on the Klamath during the last century which are in the process of being removed. So, Coyote stories at Bogus School on the way to Coyote's Paw. It doesn't get any better than that! 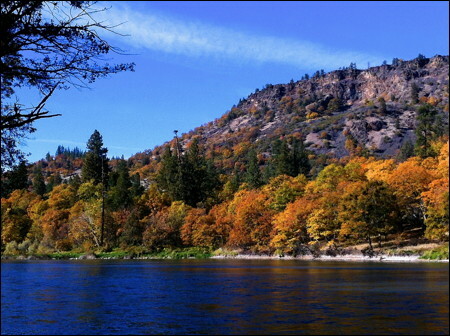 The photos show the original Bogus School and autumn colors along the Klamath River.